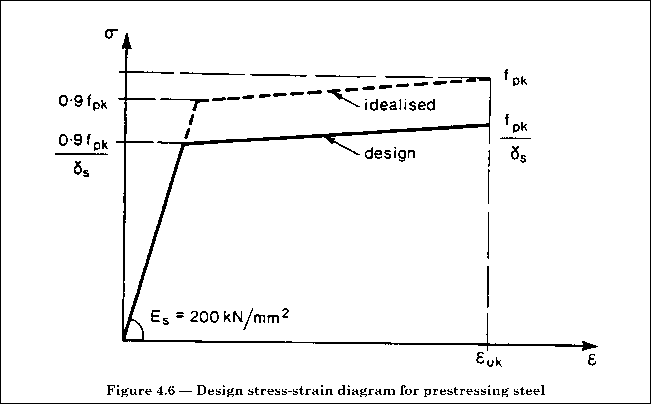 (8) Other idealized stress-strain diagrams may be used (e.g. bi-linear), provided they are effectively equivalent to the one described in (3) and (4). (9) The preferred idealization for cross-section design is the parabolic rectangular one, given in Figure 4.2. 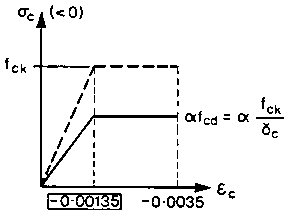 In this diagram (cu max is taken as 3.5°/oo, and compressive stress and strain are taken as negative. 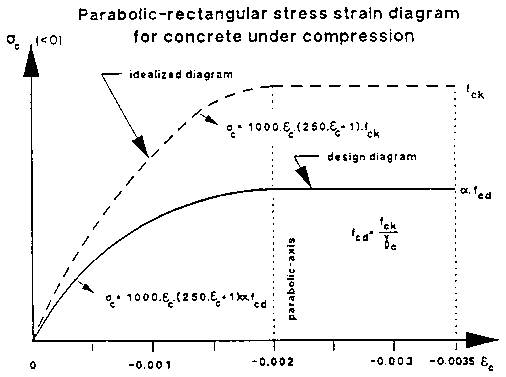 (10) Other idealized stress-diagrams may be used, provided they are effectively equivalent to the parabolic-rectangular diagram, with regard to the shape of the compression zone in the cross-section (e.g., the bi-linear diagram in Figure 4.3). is a coefficient taking account of long term effects on the compressive strength and of unfavourable effects resulting from the way the load is applied. The additional reduction factor a for sustained compression may generally be assumed to be | 0.85 |. (12) A rectangular stress distribution (as given in Figure 4.4) may be assumed. The a-factor as given for the idealized diagram is valid, except that it should be reduced to | 0.80 | when the compression zone decreases in width in the direction of the extreme compression fibre. (1) The data given in Table 3.3 are mean values, valid in the temperature ranges of 3.1.2.5.5(3), and may be assumed to represent the final coefficients of creep and shrinkage for concrete, where compressive stresses do not exceed Bc = | 0.45 fck |. (2) For detailed calculations involving loss of prestress, the general information in sections 3.1, 2.5.4 and 2.5.5 may be used where appropriate, in following the procedures set out in 4.2.3.5.5. For notation used in this section, see 1.6 and 1.7. P(1) Data on material properties given in this section are either representative values, corresponding to the relevant steel grade specified in appropriate Standards, or are idealisations suitable for design purposes. (2) In general, the properties specified are those given in 3.2.1(5) and established in EN 10080 or other appropriate Standards. P(3) Unless stated otherwise, design shall be based on a specified grade, represented by its characteristic yield stress (fyk). (4) All types of reinforcing steel specified in 3.2, which satisfy the mechanical, physical and technological requirements of EN 10080 or other relevant Standards, may generally be used in design, in accordance with 4.2.2.2-4.2.2.4, unless greater accuracy is required. (1) The values given in 3.2.3 may be used as design data. They may be assumed to be valid in the range from - 20 °C to 200 °C. P(1) For all types of steel, the values for euk, fyk, (ft/fy)k and ftk shall be defined. (2) Values for these properties and for defined types and grades of steel may be taken from EN 10080. For other types of steel, these properties should be established by testing. (3) If not specified otherwise, the yield stress and the ultimate strength may be assumed to be equal in tension and in compression, for design purposes. (4) Design calculations may be based on the nominal size and the nominal cross-sectional area of the reinforcing steel. P(1) The general ductility requirements shall be in accordance with 3.2.4.2, and as specified in relevant Standards. (2) For overall analysis, the idealised bi-linear diagram in Figure 4.5 may generally be used. This diagram is valid for temperatures from - 20° to 200 °C. (3) Figure 4.5 may be modified, e.g. with a flatter or horizontal top branch, for local verifications and section design. (4) Design values are derived from the idealised characteristic diagram, by dividing by Ys, the partial factor for reinforcing steel (see 2.3.3). — a horizontal top branch to the design curve in Figure 4.5, i.e. 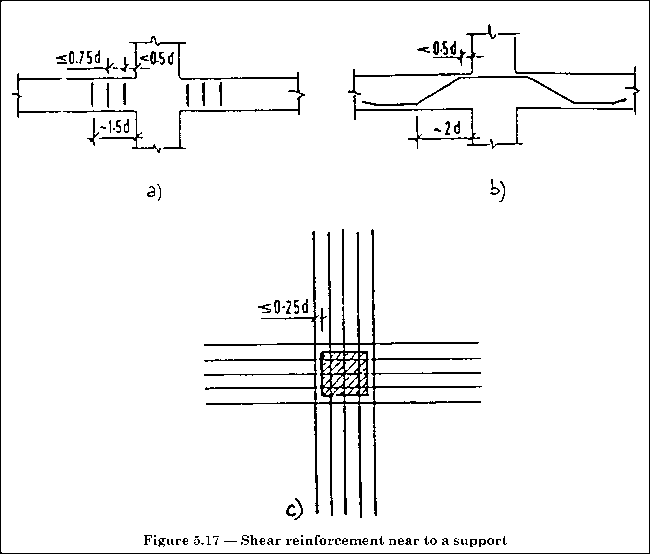 the stress in the reinforcement is limited to fyk/Ys, with no limit to the steel strain, although in some cases it may be convenient to assume a limit. P(1) Bond and anchorage properties shall be derived from the shape of the surface characteristics of the bars and/or from the strength of welded joints of welded fabric. (2) Bond requirements should comply with 5.2.2. (3) Anchorage requirements should comply with 5.2.3-5.2.5. (2) In general, the properties specified are those given in 3.3.1(5) and established in EN 10138 or other appropriate Standards. P(3) Unless stated otherwise, design shall be based on a specified grade, represented by its characteristic 0.1 % proof stress (fp0.1k). (4) All types of prestressing steel specified in 3.3, which satisfy the mechanical, physical and technological requirements of EN 10138 or other relevant Standards may generally be used in design, in accordance with the data given below, unless greater accuracy is required. (1) The values given in 3.3.3 may be used as design data. They may be assumed to be valid in the range from - 20 °C to 200 °C. P(1) For all types of prestressing steel the values for fp0.1k, (uk and fpk shall be defined. (2) Relevant properties for defined types and grades of steel may be taken from EN 10138. For other types of steel, the properties are to be confirmed by technical approval documents. (3) Design calculations may be based on the nominal size or the nominal cross-sectional area of the prestressing steel. P(1) The general ductility requirements shall be in accordance with 3.3.4.3, and as specified in relevant Standards. (2) An idealized bi-linear diagram is given in Figure 4.6. This diagram is valid for temperatures from - 20 °C to 200 °C. (3) Figure 4.6 may generally be used for overall analysis, local verifications and the checking of section capacity. (4) Figure 4.6 may be modified, e.g. 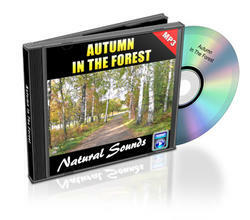 with a flatter or horizontal top branch, for local verifications or section design. 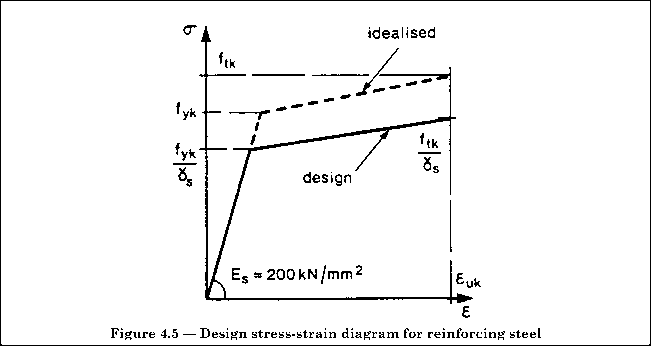 (5) Design values for the steel stress are derived from the idealized characteristic diagram by dividing by Ys, the partial factor for prestressing steel (see 2.3.3). — a horizontal top branch to the design curve in Figure 4.6, i.e. the stress in the prestressing steel is limited to 0.9 fpk/Ys with no limit to the steel strain, although in some cases it may be convenient to assume a limit. — an inclined top branch, with the increasing steel strain limited to | 0.011. (1) For structural analysis, if not stated otherwise, post-tensioned tendons may be assumed as having high ductility: pre-tensioned tendons are assumed as having normal ductility. (1) For fatigue requirements for prestressing steel, see Part 1E. (1) If not stated otherwise in technical approval documents, tendons assembled from prestressing steel satisfying the requirements of 3.3.4.6 may be considered to withstand the full specified tensile strength, if the bending radius of the saddle, which is supporting the tendon at its point of deviation, satisfies the requirements of Table 4.4. (2) The values in Table 4.4 do not relate to the coefficients of friction in 4.2.3.5.5(8). in which: n1 = total number of wires or strands in the tendon n2 = number of wires or strands transferring the radial force of all wires or strands in the tendon to the deviator. (See Figure 4.7 below). (1) Tendon anchorage assemblies and tendon coupler assemblies satisfying the performance requirements of 3.4.1.2 may be considered to withstand the full characteristic strength of the tendon. P(1) Certificates accompanying the consignments shall indicate the class and relevant relaxation data of the prestressing steel (see 3.3.5, and relevant Standards). (2) For design calculations, the values which may be taken into account for losses at 1 000 h are either those given in the certificate or those assumed in Figure 4.8 for the three classes of steel shown. The long term values of the relaxation losses may be assumed to be | three | times the relaxation losses after 1 000 h.
(3) An indication of how relaxation losses increase between 0-1 000 hours is given in Table 4.5. What are extreme fibre in concrete? What is mean by extreme fiber of concrete?